Mastery of the basic addition facts helps tremendously in the learning of the advanced math skills taught in the 2nd grade and above. When learning basic addition facts students are often overwhelmed with the volume they need to memorize. By playing games students can practice the facts in a fun, non-stressful manner. This product is a resource to help students master these facts by completing a 24 piece puzzle using their knowledge of the addend 2. 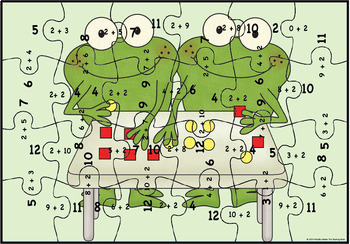 This puzzle can be used in a learning center, at the student's desk, or sent home as a resource for home practice. Also, contains a Common Core Standard Alignment Checklists for grade K-2. 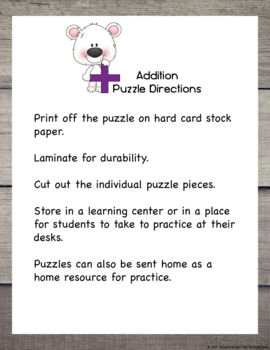 **Please note this activity is included in my Addition Addend Puzzle Bundle. 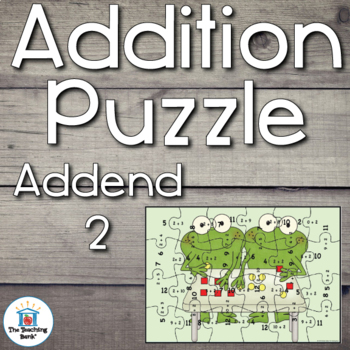 Get 11 puzzles for addends 0-10 at a discounted rate.